Asia’s best street food stalls are coming together under one roof for the second annual MICHELIN Guide Street Food Festival Macau (organised by Michelin and Robert Parker Wine Advocate, with full support from Official Title Partner Melco Resorts and Entertainment). From Saturday, 29 September – Tuesday, 2 October, the world’s biggest Asian street food festival with Michelin-acclaimed food stalls and eateries will be serving their famed signature creations on site. Entry to the festival is free of charge for all guests, with access to a world-class selection of dishes priced between MOP40-MOP60 and redeemed via cash coupons. 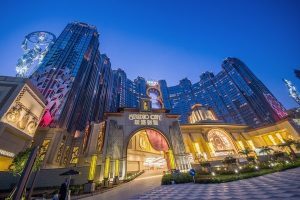 Taking place at Studio City’s Macau Gourmet Walk, the festival will once again feature some of the biggest names in street food, as well as one of the only Michelin-starred hawker stalls in the world. One such eatery is Liao Fan Hawker Chan Soya Sauce Chicken Rice from Singapore led by Chef Chan Hon Meng, the first in the world to earn a coveted Michelin star for street food. His iconic Soya Chicken dish is raved throughout the world as the most affordable Michelin-star meal, and will once again be available in Macau this year. The Song of India, also from Singapore, has upheld its one Michelin star and will be coming to Macau for the second year in a row with Chef Manjunath Mural at the helm. From Taipei’s Nanjichang Night Market, A Nan Sesame Chicken specializes in a Sesame Oil Chicken Noodle Soup developed over 13 years that made it a deserved recipient of the MICHELIN Guide Bib Gourmand award. From Bangkok, Thailand, Huen Lamphun (Suan Phak) is a local eatery serving prized versions of dishes from its regional cuisine, and will be serving its famous northern Thai Khao Soi Kai at the festival. Soul Food Mahanakorn, also from Bangkok, will be presenting its Penang Curry with Beef Brisket, Bharred Pineapple and Peanuts, alongside a trove of other critically acclaimed dishes. Keng Eng Kee Seafood, returning for the second year in MICHELIN Guide Street Food Festival, is known for serving the best tze char in Singapore, with Chef Wayne Liew specializing in wok-fried dishes and a mish mash of Hainanese and Cantonese cuisines. Pearl Dragon, helmed by Chef de Cuisine Lam Yuk Ming, is a one-Michelin-starred Cantonese restaurant (2017-18) that offers an exquisite dining experience at Studio City. With a dedication to perfection, Pearl Dragonoffers a menu showcasing refined provincial Chinese flavors, innovative culinary creations and the finest delicacies to tempt your palate. Chef Lam Yuk Ming will be showcasing a Deep-Fried King Prawn stuffed with Minced Bamboo Shrimp in Sweet & Sour Sauce as well as a sweet dish, a Chilled Bird Nest with Red Bean Paste in Organic Pumpkin. Departing slightly from the style of hawker street food, Bi Ying is one of the signature restaurants in Studio City that offers a delectable culinary journey around Northern and Southern China, highlighting provincial favorites including wood-roasted dishes. A man of many talents, Jakkrapan is often seen serving guests with a smile at his family-run establishment, Huen Lum Phun. Jakkapran is no doubt one of the key driving forces for HLP’s many successes, having seen the restaurant grow over 6 years from a small 20-seat eatery to 300 seats across 2 branches and a small boutique cafe. Today, his dedication continues to be noticed, as he covers all aspects of operations from designing new menus, quality and cost control and hiring new employees, to administrative tasks such as accounting, marketing and PR. From the Isaan province of Yasothorn, Chef Eak moved to Bangkok when he was 16 years old. He began working at various food stalls in The city, mostly cooking Isaan food. Chef Eak has been working with Soul Food Mahanakorn since the start and has been an integral part of the team. Over the years, Chef Eak has been able to develop his own style of Thai Cooking that incorporates elements of American Barbecue. In 2016, Chef Chan Hon Meng’s hawker stall became one of only two street food stalls in the world to be awarded a Michelin star. Since his recognition, Chan Hon Meng has become a champion for Singapore’s traditional hawker food centres. This is the second time he’ll be cooking in Macau. An icon of the Singapore restaurant scene, The Song of India’s Chef Manjunath has been taking gourmands on a culinary journey through India for over a decade. From a very young age, Chef Lin was passionate about pursuing a culinary career and serving the best food in Taiwan. It took 13 years to realize his dream – the time it took to perfect his critically acclaimed Sesame Oil Chicken Soup. Chef Lin’s father, his ultimate role model, inspired the name “A Nan Sesame Chicken”. Pearl Dragon, helmed by Chef de Cuisine Lam Yuk Ming, is a one-Michelin-starred Cantonese restaurant (2017-18) that offers a truly exquisite dining experience at Studio City. It also received a Four-Star Award from the prestigious Forbes Travel Guide (2018). With a dedication to perfection, Pearl Dragon offers a menu showcasing refined provincial Chinese flavors, innovative culinary creations and the finest delicacies to tempt your palate. Pearl Dragon was also named Top 20 Best Restaurants in the Hong Kong Tatler Best Restaurants Hong Kong & Macau Edition 2017 and received SCMP’s 100 Top Tables award in 2017-18. From north to south, Chef Kenneth Law’s delicious dishes take diners on a culinary journey through China. His Iberico pork dish is one of the most loved signatures at the restaurant. Chef Wayne Liew presents a selection from his menu which has been passed down by two previous Singaporean generations.